The Lourve Abu Dhabi has been awarded a spot in the list of the ‘seven urban wonders of the world’. 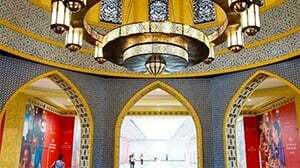 The UAE capital’s leading art gallery was chosen for its “impressive installations”, said LikeWhere who used crowdsourcing technology from travellers around the world to conduct the study. The travel technology company looked at travel preferences of 18-35 around the world, and complied a shortlist of the places which scored the highest in seven categories: local cuisine, architecture, heritage and culture, diversity, activities available and Instagrammability. Arguably one of the best art galleries in the UAE, this stunning piece of architecture opened its doors on November 8 2017. Current installations include Animals, Between Real and Imaginary and Japanese Connections: The Birth of Moden Décor. The iconic Sydney Opera House is one of the most Instagrammed locations in Australia. The famous music hall has appeared in multiple films, books and of course, Instagram posts. One of the most popular street food and flea market destinations in the British capital, Camden Market has long been popular with young travellers visiting the city. This incredible waterfront stretch includes 52 historic structures. With fantastic views of the Shanghai skyline, its certainly worth a visit on your trip to the city. The markets in Hong Kong are an integral part of the city’s vibrant food and crafts scene. Stop by in the evening to try street food against the backdrop if the street’s famous fluorescent neon signs. This stunning Austrian museum holds around 1 million old master prints and 65,000 drawings. A key attraction in the Austrian capital, its also popular on Instagram too – being tagged more than 70,000 times on the photo sharing app. Food destinations were high on traveller’s lists according to the study and this well-known Japanese fish market was no exception. You might recognise it from the 2016 Netflix film Tsukiji Wonderland, although major renovations are taking place this October which will see the space evolve.